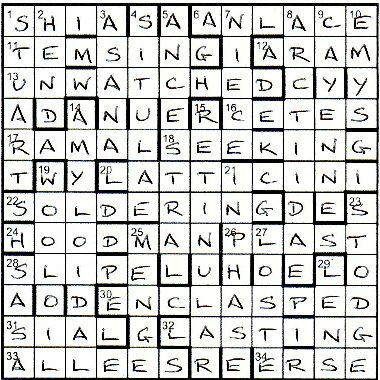 I cannot recollect where or when I first came across the splendid anagram WILLIAM SHAKESPEARE = I AM A WEAKISH SPELLER, but it was towards the end of March 2010 that I decided to make it the theme of a crossword, and a Listener if at all possible! The title I settled on is a phrase of Sam Weller’s (see the ODQ sv spell) that was obviously thematic, but I also liked the fact that Chambers lists each noun with a special Shakespearean meaning. There are eighteen letters in WILLIAM SHAKESPEARE and so settling on that number of clues across and down was a no-brainer, as was settling on misprints as the basic gimmick. I soon decided that each across clue should contain one misprint, with the correct letters spelling out WILLIAM SHAKESPEARE, and that each across answer should be entered with one misprint, with the ‘wrong’ letters occupying unchecked cells and spelling out I AM A WEAKISH SPELLER. It could have been the other way round, of course, but that would have been easier for the solver and I wanted this puzzle to be a really tough one. I use the wonderful Sympathy to construct grids, and the even more amazing Mathematica to construct word lists which Sympathy then converts into dictionaries which it then uses to fill the grid appropriately: in this case, with a word **** at 1a where **I* is a different word, with a word ****** at 6a where either A***** or **A*** is a different word, and so on. I could probably have filled the grid with the misprints symmetrically disposed (so at 6a/33a for instance we’d have either A*****/*****E or **A***/***E**), but for once I abandoned symmetry in favour of a tougher task for solvers. One of the Listener editors thought that some solvers might well find plausible alternatives to I AM A WEAKISH SPELLER and so I was asked to reconsider the relevant part of the preamble. My original version had read The answer to each across clue must be entered with one misprint and the ‘wrong’ letters must all be highlighted, but before the clue can be solved a misprint somewhere along its length must be rectified, with the correct letters spelling out an associated name. I devised the alternative Before each across clue can be solved a misprint somewhere along its length must be rectified, with the correct letters spelling out the name of a person, and the answer must then be entered with a misprint of one letter (always giving a word) with the “wrong” letters spelling out a five-word statement that the person could have made, the last nine words of which hinted at the crucial anagram. Having the down clues reveal Shakespearean ‘funnies’ was yet another no-brainer, but I soon saw that I’d need two misprints per clue rather than one if I was to have a decent number of ‘funnies’, and the obvious solution was one per definition, one per wordplay. My original preamble had read with the correct letters spelling out various words, but the editors altered this to with the correct letters spelling out (in order of occurrence, read boustrophedon) five words that the person apparently did use, which sadly removed a nice pdm (see (ii) below). It was obviously going to be a tough solve, and so I sought some non-obvious ways of helping the solver a bit, via symmetry of some kind. I decided (i) that the misprints in each pair of across clues should affect definition and then wordplay or vice versa, (ii) that the misprints in the down clues should lead to the correct letters in the right and wrong order alternately, and (iii) that the definition/wordplay misprints should lead to the right and wrong order equally often. Setting the clues, especially the two-misprint ones, was quite a challenge (my thanks to the editors for suggesting several improvements), but it was also great fun. I hope that solving them also proved a fun experience — for some solvers at any rate! This week, time for one of the Listener stalwarts. Hold on, that’s not really the word I’m looking for … no, can’t think of it yet, but someone who certainly knows his stuff, and someone who knows what’s fair. A read through of the preamble, however, made me think he’d lost the plot! More misprints floating around than was good for anyone of a less than robust disposition. Still, I knew that the word of the week was ‘fair’. Oh, and devious is probably a good word for Radix as well, and the clues certainly bore this out. I don’t think there’s any scientific way to approach this sort of puzzle. It probably relies on a words just popping into your head from time to time, and then being able to fit bits of wordplay into a definition, or vice versa. I know that it is true every week that no two people will solve the clues in exactly the same order, but here I suspected that there would be no pattern as to which clues were the first two or three to be solved. The first clue for me was 24ac Nice woozy Mogadon which gave GOODMAN. That was all the acrosses I got to start with! 1dn came next Fancy us with prat of royal horse leading to STUART. It was guessing that ‘horse’ would become ‘house’ that enabled the clue to be solved. Unfortunately, there were precious few obvious misprints in the downs. 5dn Claret’s no hybrid of wine, for example, was obviously an anagram of clarets no with a misprint, and a misprinted wine was the definition, but there were probably a couple of dozen possibilities. The only thing to do with a clue like that is to leave it till later. 8dn Mothy hat and cardi I trashed was a lovely clue, fairly easy with Mrs B’s help, but what a lovely surface reading. This was countered by 14dn Concerned with “jell” problem, Delia’s befuddled by bit of alcohol where I assumed that Delia would be a misprint for delta and bit of alcohol would be A. It turned out to be AMYL (an alcohol radical) + DOLIA*. And so, over two sessions stretching just over four hours, I completed the grid. The correct letters in the across clues spelt out William Shakespeare (not William Makepeace Thackeray who I juggled with at one point). The down clues then spelt out some Shakespearean words: turbond, galowses, pajock, sneak-cup, handsaw. It had also become obvious at some point during this process that the misprints in the across entries all occurred in unchecked cells! Our job was now to determine which of one or more alternatives needed to be used to spell out what statement the person could have made. Of course those last three words were the clue, but I didn’t realise it until about an hour later. Twenty minutes later, and, with the last word popping into my head first, I had I am a weakish speller. A bit strained, or even tortuous, but I suppose Shakespeare could have said it. I wrote the phrase below the diagram, but before I’d finished, all became clear: William Shakespeare was an anagram … or rather the other way round. Superb! An excellent puzzle from one of the masters … ah, yes, that’s the word I was looking for. Fair in every respect, and tough in just as many. A word of thanks to him for over five hours of entertainment. So I look up TASTE and FANCY and wonder what Shakespeare made of those and Hmmm! To TASTE for him, was ‘to enjoy carnally’ according to Chambers and FANCY verges on the dubious, though Shakespeare seems to have accepted that it could be just love. So is Radix being naughty or have I prudishly tripped at the final hurdle? ‘Ancient Goodies and Cleese finally featuring in books (5)’. Yes, I know the Goodies, actually skied with Tim Brooke Taylor in the Club Med in St-Moritz when he was but a lad, but were we really dealing with the Goodies here and John Cleese (and if not, how did Radix manage to slip that capital G past the editors, and a V on Vogue that turned vague later on? Another numpty Hmmmm!) Well we weren’t. These Ancient Goodies were CATES and we got to them through the astonishingly complex misprint boAks (or CATS) around the end of Clees(E) No, of course I am not complaining, I wouldn’t dare and it was a super clue. These clues took hours and we had completed and mailed the crossword before we could solve my other example. ‘At some stage reap share (7)’. The grid only allowed us INPHASE and we had played with ‘at Home’ but our required set of misprints needed A and K (to produce SNEAK-CUP, that lovely textual error in Henry IV Part I – probably committed by one of those scribes who were hired to sit in the Globe and scribble down a pirated text of the play). So we had to opt for ‘In sAme stage’ producing the A misprint. But the K? Two friends finally explained to me that ‘reap’ = IN and ‘shaKe’ (with the K misprint) gives ‘faze’, which can be spelled PHASE. 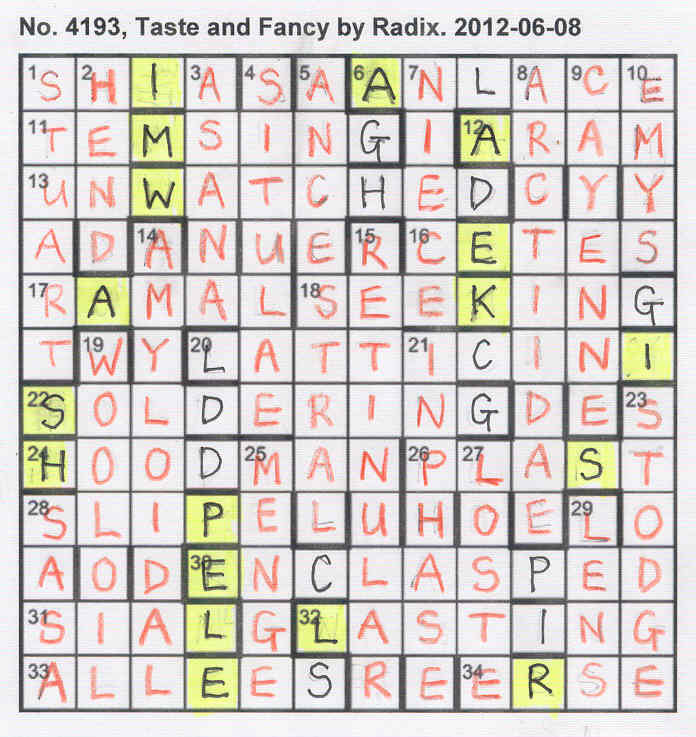 However, for this crossword to really star, there had to be a final WOW moment – a pdm. We had assumed from the start (knowing Radix’s high standards) that all down entries were going to be real words, so across misprints were most likely to be in the across unchecked lights. We entered the downs in red and forgot about them. As I laboriously worked through all the possible misprints that could go into the other lights (WI/AIU/MN/CDAPT/HWL/EIOUY/ OA/ DKLPW/ IO/ PS etc) I decided that the numpty blog would be one of those ‘damning by faint praise’ things’ as this seemingly impossible task couldn’t lead to a flash of brilliance …. could it? Of course it did … I AM A … I had already spotted the …ISH early in the solving process and there it was: I AM A WEAKISH SPELLER. Even a numpty can see what that anagrams! THE BARD of course. So Radix has done it again! I hope he will be persuaded to tell us how long it took him to put such an astounding quantity of material into his crossword. Many thanks! Were we the only people expecting this theme? I doubt it. Jago has given us welcome breaks from weekend-long Listeners in the past and this was no exception. Solutions were being slotted into the grid as it came off the printer and we had the bottom right-hand corner completed faster than we could write. This is not a complaint! When I blogged Samuel’s Spiral three weeks ago, I commented that we liked a few 1s and 2s on the scale of difficulty to balance the Mash and Sabre 9s and 10s (I notice Mash won the Samuel – appropriate really!) Well, we had our 2. It’s the Jubilee weekend so, as soon as we had a J in JEWRY ‘They’re said to be a group sworn to uphold justice — maybe Israel? 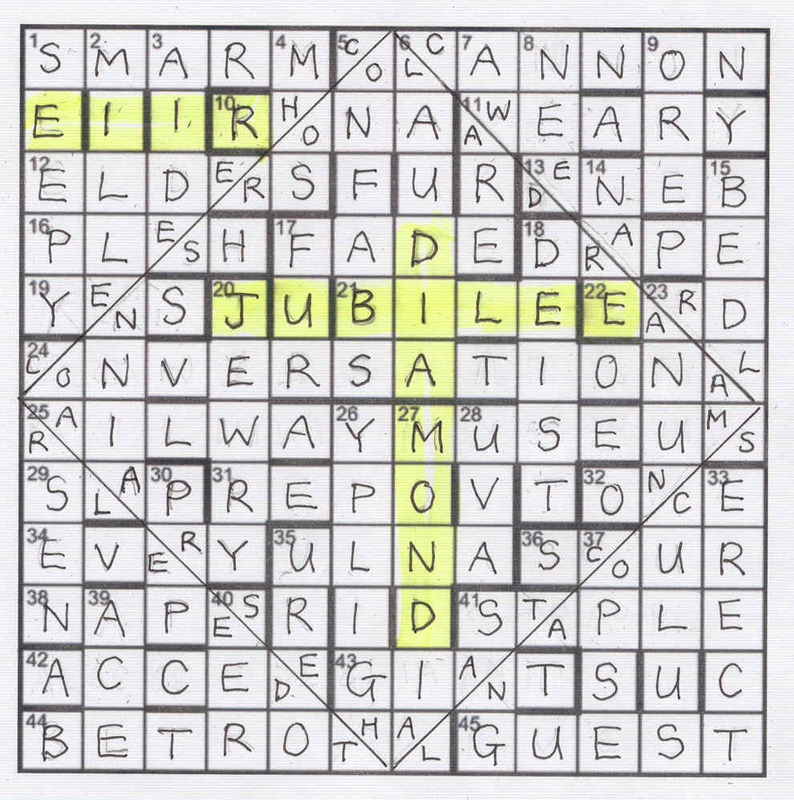 (5)’, we were looking for JUBILEE (in fact, it was one of those clues where we slotted in the answer then looked for the clue – oh dear!). I don’t pronounce JEWRY and JURY in quite the same way but I suppose it passes as a homphonic clue. I am less sure about SEEPY Snow ‘Sounds rather like Mr Snow, initially, could be quite wet? (5)’. I wonder what CP Snow would think of that, even admitting the ‘rather like’ of the clue. But then, I rarely find a homophonic clue satisfactory, as what sounds like something for a home-counties person probably doesn’t for a true-blooded Yorkshireman and even if Chambers has the same phonetics for two words, the stress pattern in context will change one of them. Gripe over! We were delighted when our anxiety about getting all those cell dividers in the right place proved to be groundless. A diamond shape emerged, defining the other squares that were to be split, and we were on the home straight. Within an hour our grid was complete and DIAMOND had appeared neatly bisecting JUBILEE. That made thirteen letters and left four to find. ‘MARM’? muttered one numpty. ‘Don’t be silly!’ said the other – look, she’s just below as E11R. This was a celebratory weekend so I naturally looked for the usual Listener compiler’s alcoholic tipple and was initially rather disappointed when Jago seemed to be celebrating with a dish of potatoes and cabbage (Sea captains to steer entering Panamanian port for dish of potatoes and cabbage (9)’ COLCANNON) but, of course, he redeemed himself in 36ac, ‘Range about, looking for a swig of Scotch, perhaps (5)’ (double definition). Thank you, Jago. That was a bit of Jubilee fun from start to finish. This week, we were greeted by a nice short three-line preamble, and one of those was the Chambers reference. Ten answers needed modification, the nature of which was given by ‘instructions’ in other answers. This is only Nudd’s second Listener, his/her first being based on Doctor Dolittle’s pushmi-pullyu. I didn’t know whether to expect easy clues or tricky ones, but the acrosses yielded only a few answers, so I guessed they were on the tricky side. 15 ROLL-TOP, 17 TEEM, 18 ELITE, 22 ATTORN, 34 ATOP, 37 STIRRUP, 39 AXENIC and 41 DROPLET were pretty straightforward, but then came 42 NICOTINE which only had a 5-letter entry space and meant that I had been remiss in not checking out answer/entry length discrepances earlier. In fact, none of the other acrosses had a difference, but there were seven such down clues. Oh dear, that meant there appeared to be two modifications that did not affect the length of the entry. It sounded as though they could cause problems. To summarise then: there were two entries that had the same length as their answers, six that were three letters shorter, one that was one letter shorter, one that was four letters shorter and, just to take you out of your comfort zone, one that was one letter longer and one that was two letters longer. Ouch! I’m sure it was going off to check the answer/entry lengths that meant that I didn’t make the connection between AXENIC and NICOTINE very quickly, even though I solved them within about three minutes of each other. Luckily for me, 1dn was an easy DRUPE, with the P clashing with the R of ROLL-TOP, and 3dn COL looked like it was the one that gained a letter. 11dn Jazz fan, out of time and maybe improvising at Ronnie Scott’s, fondly embracing… (10) CANOODLING was made easy by my having come across that meaning of ‘noodle’ only a couple of weeks earlier in an EV puzzle. It looked as though LING would go in, but which four of the remaining six letters needed to be dropped. If only my luck had held out and enabled me to get 21dn JUNKANOO on my first pass through the down clues, I’m sure that I’d have made the link with ‘canoodling’ sooner and the puzzle would have been a bit easier. However, it wasn’t too much later that I got that answer and the penny finally dropped. Other entries came to the rescue, and LOSEL, STIRRUP, and OUSTITI revealed their purpose and just needed to be matched up with the answers they were to affect. Although it wasn’t quite plain-sailing, everything came together fairly nicely until I tried to resolve 35dn. I don’t know whether it was a deliberate trap to make 34ac easy A bit of a kip precedes work on the summit (4) ATOP. I first came across ‘a bit of a kip’ meaning ‘at’ (a kip is 100 at … currency in Laos) a few years ago, and I apologise to the setter who first used it that I don’t know who you are. Anyway, a relatively easy clue (now) that I slotted in without a moment’s thought. Of course, that meant that 35dn Character in play (Shakespearean) left off old shirt (7) was a very difficult solve if you thought it began TART…! It took quite a long time to realise that 24dn PROTEAN did not have its top rolled to give TROPEAN, but was a normal entry and required ATOP to have its TOP rolled to give APOT, with 35dn PARTLET! A fairly easy week, just over two hours in total, but a thoroughly entertaining puzzle from Nudd, so thank you. 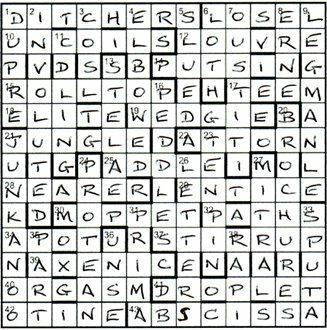 One of those quirky sorts of crossword that the Listener throws up every now and then to make us appreciate what a fun language English is.